Dyeing fabric in a washing machine has never been easier. 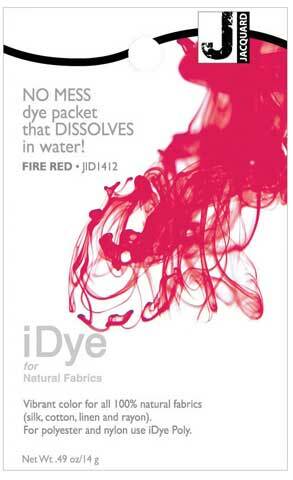 iDye comes in a 14 g. packet that dissolves in water which means there is no handling of messy dye powders. Just throw the dye packet in, add salt or vinegar and run through the wash cycle. It is the ultimate easy way to get gorgeous color! Each packet will dye two to three pounds of fabric. Available in a variety of vibrant colors and two formulas; one for 100% natural fabrics and the other for synthetics.